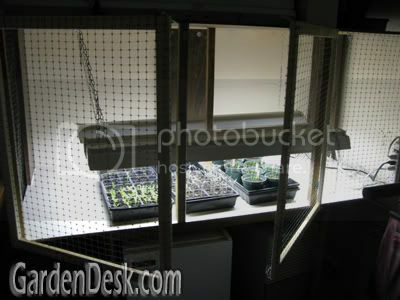 GardenDesk: Seed Starting Operation is now Cat Proof! Seed Starting Operation is now Cat Proof! This is the time of year when I get very anxious to get started with the vegetable garden. It's still too cold outside except for the crops that were overwintered like garlic, potato onions and horseradish. 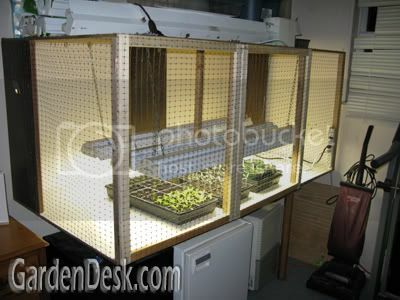 Indoor Seed Starting Doesn't Have To be Complicated or Expensive! One aspect of seed starting that I will write more about this year is using soil blocks. 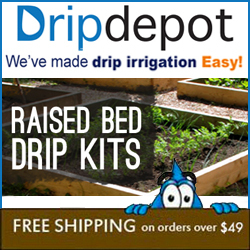 I did write about my new Soil Blocker last year, but will be using it much more this year. I've only got the bottom part finished so far but I plan to finish the top before it is needed. Right now we just have the early tomatoes, some lettuce, spinach and leek seedlings started - so the bottom level is enough. 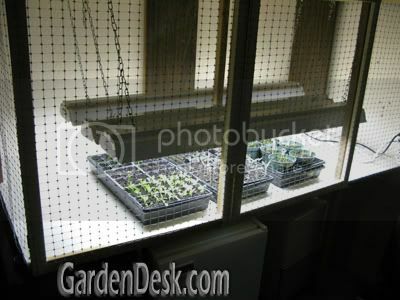 I simply stretched and stapled garden netting over the support beams and made big hinged doors out of framing lumber. This way, I can open them up to access the seedlings. The cats, however can not! Our cats, Macy and Maggie are not very happy with me but the seedlings are! I'm ready to start many more seedlings. How about you? 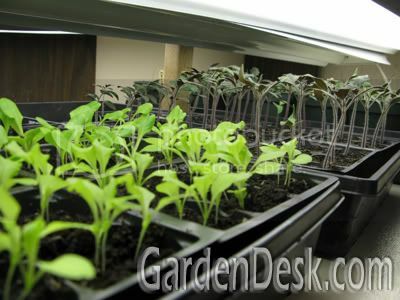 Do you start vegetable or flower seeds indoors? Do you have any problems with pets bothering them? 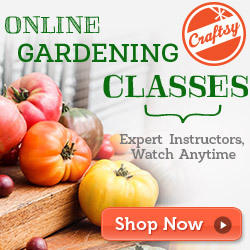 What types of vegetables do you have started already? Im-pressive. Poor kitties! They'll have to get their greens somewhere else. 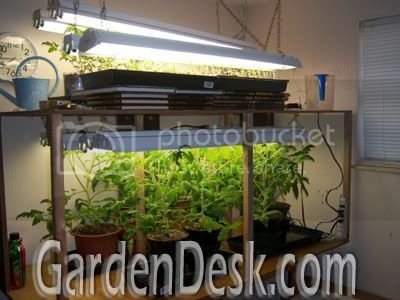 I have lights under various and sundry places around the house but I really need to do something like your setup. I've grown everything indoors so far. 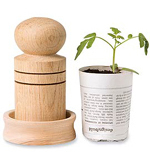 I have a variety of Russian tomatoes, about 10 different types of peppers both sweet and hot, strawberries, herbs, carrots, onions, various flowers and shrubs, and an assortment of fruit trees that may or may not grow to maturity in their respective pots. What a great idea! This is our first year with a cat. Good to know she will probably be into the seedlings too. Great idea! I too have been starting seeds indoors. My blog is peppered with shots of my setup, since that's about all that's going on right now. I've also been talking about how to keep my cats from eating my seedlings. They haven't shown interest, but they love that room and would be more than curious about the new contraption in it. I love your solution, but I used PVC to make my system, so it's tough to attach things to it. In the end I just closed the door. Simple solution that worked in my case. I remember that post from last year. It happened right before our cat, who I was sure wouldn't be a problem, ate my basil plant. At that point the cat reverted to being my wife's cat. It's always her cat when it gets into my plants. 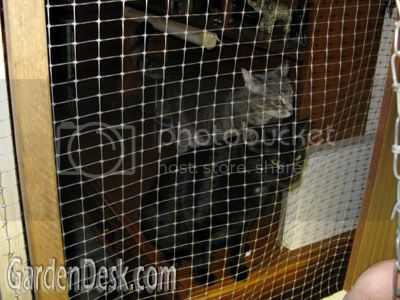 My current cat-proofing isn't nice looking like yours, but it's been effective so far. That picture of your cats on the outside looking in is hilarious. Last year was the first time I ever tried to grow anything, and I started from seed. One morning, I came into the kitchen to find one of our cats eating my four week-old pepper plants down to the soil. It was like she'd disciplined herself not to eat them until they were big enough to make it a real feast. This is my first year starting seeds for a vegetable garden. I have started all kinds of seeds (including flowers) and now that it is nice out, every day I haul them outside and then bring them back in at night. My husband thinks I'm crazy, ha ha! Anyway, when do you put them in the ground (potatoes, lettuce, spinach, and peas)? I read that March 15th was the day, but our garden bed is not ready yet. I have start some early tomatoes like you have. I have also started onions in Jan, Hot peppers in Feb, and have just started all the cole crops about a week ago. I also have a few things growing in the coldframe already, mixed greens, romaine, green onions, radicchio, bok choy & kale. Things are really starting to move ahead! That's an awesome set up! !